Bulgaria has displayed itself a bit special to me. The first thing I had to do when I entered this country was to dodge a turtle on the street. Then the people on the street were giving me light signals. I stopped to check my bike and found nothing wrong. I switched off the lights of the bike. I thought they my find it useless and thats maybe the reason for the signals. In the next village I found out the real reason — A POLICE CONTROL. They stopped me, checked everything and informed me that I have the lights on all the time. But they let me go without any intention of extra money. The kids in the villages and also a shepherd waved at me. What a wonderful country. Women on the street were waving as well. But according to their clothes they were after my money and nothing more. I still can’t think of any sense for a prostitute waving at a guy on a full packed motorbike. 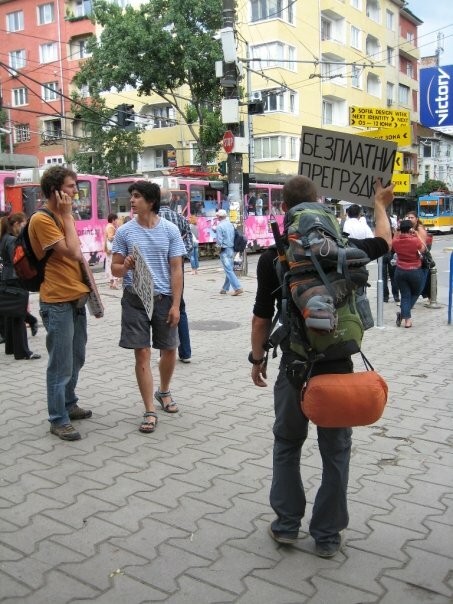 Anyway, I got to Sophia and met with my couchsurfing host Sasho at “Popa Square”. 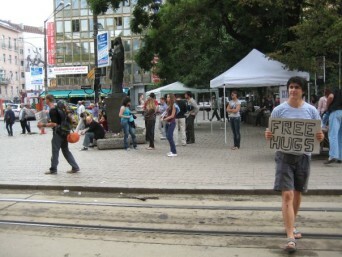 Sasho wanted to meet at the same time with about ten other guys of couchsurfing for an event called “Free Hug”. 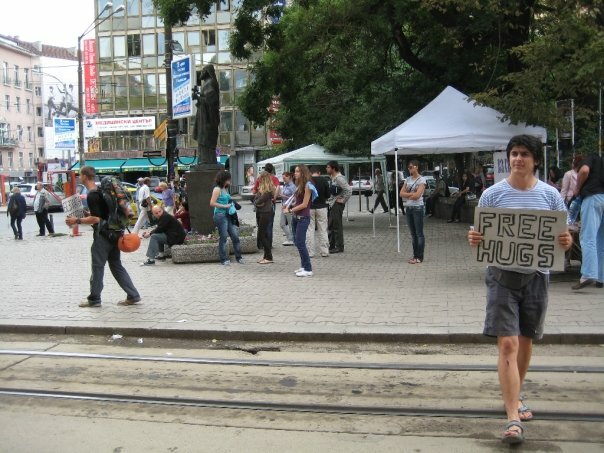 This event was just to give anyone a hug who wanted one. We were only four including me but I found it great. 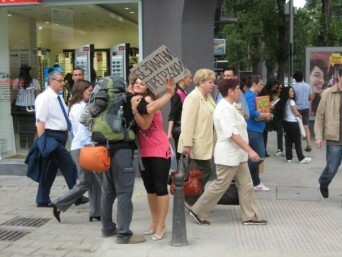 Even though only every 30 to 40 person wanted/accepted a hug we put a smile on many peoples face. 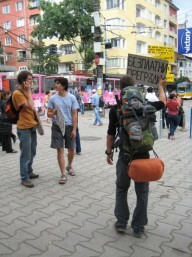 I participated also a little but with my bagpack, pick and motorcycle clothes it was kinda difficult. So I made mostly pictures. What a funny world!